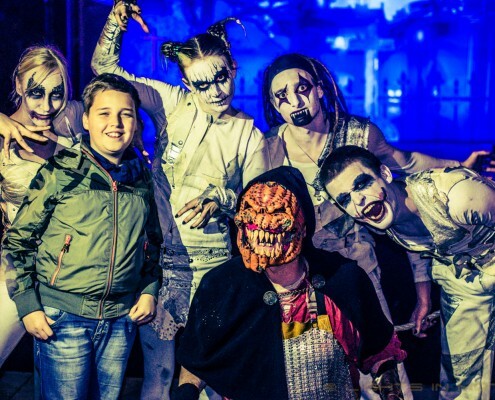 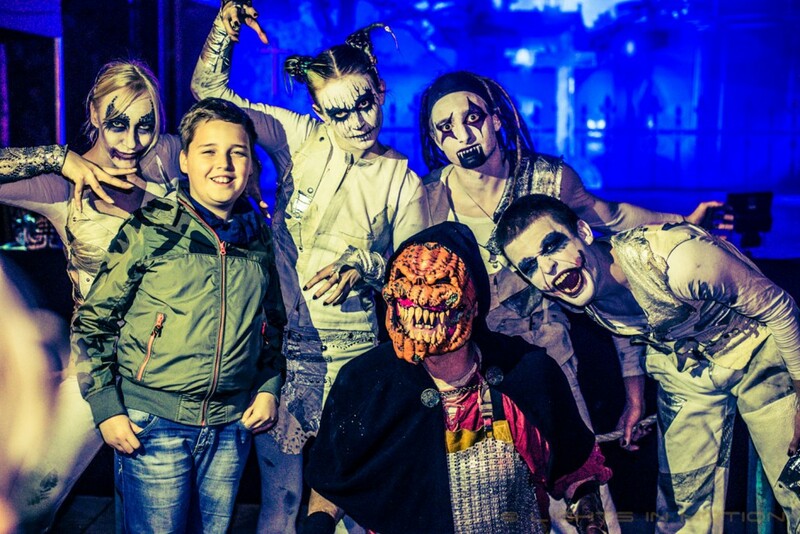 During the month of October the Dutch amusement park Toverland was in the theme of Halloween, which could be enjoyed by both the young and older visitors. 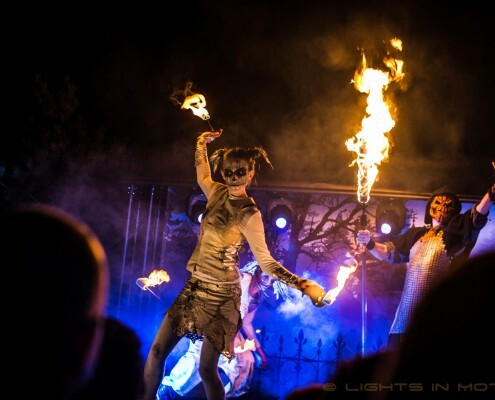 The park operated normally during the day, but after sunset the park was taken over by scary monsters and evil creatures to transform it into a spooky Halloween playground. 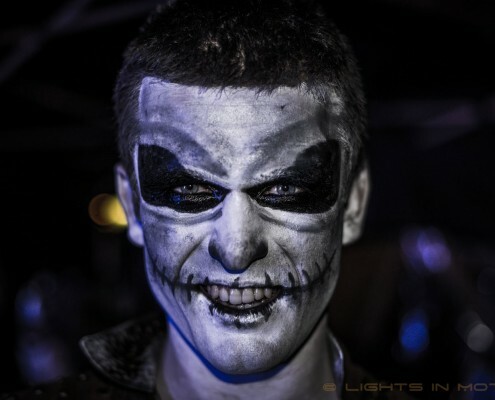 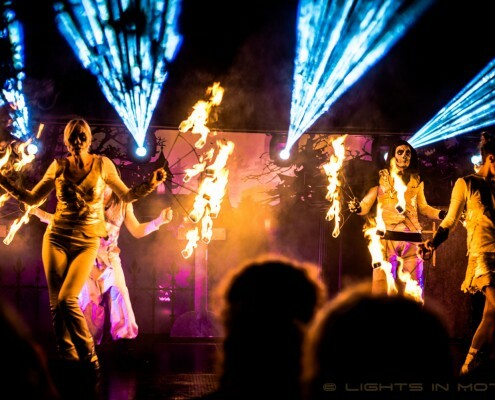 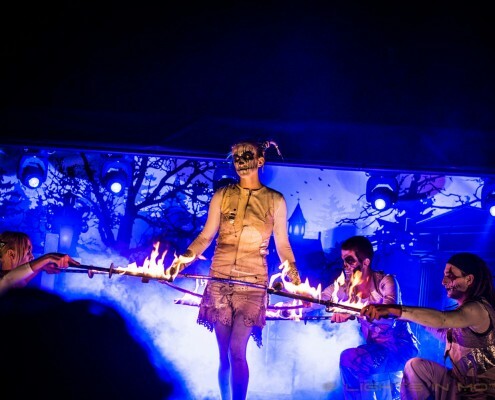 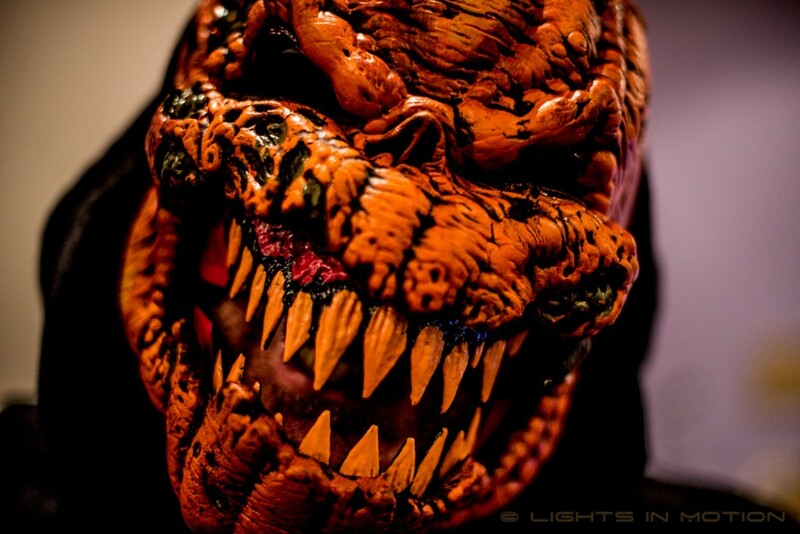 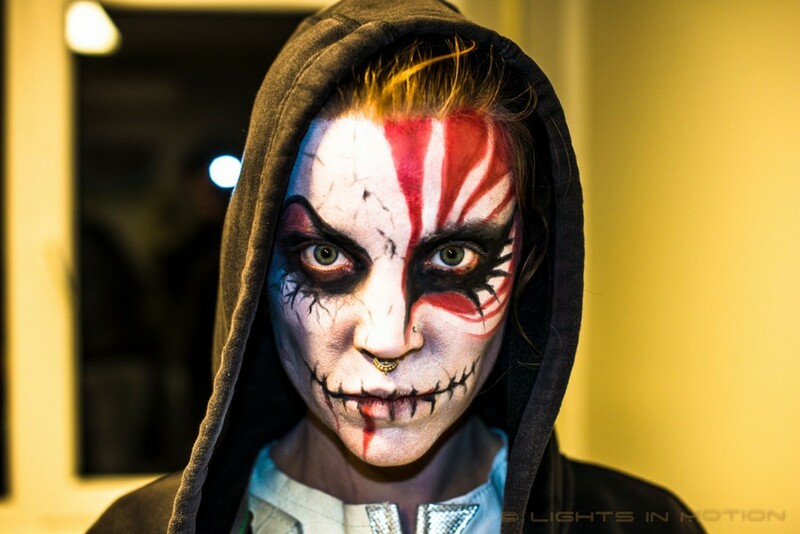 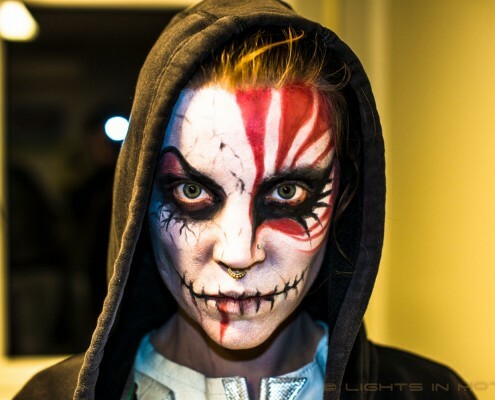 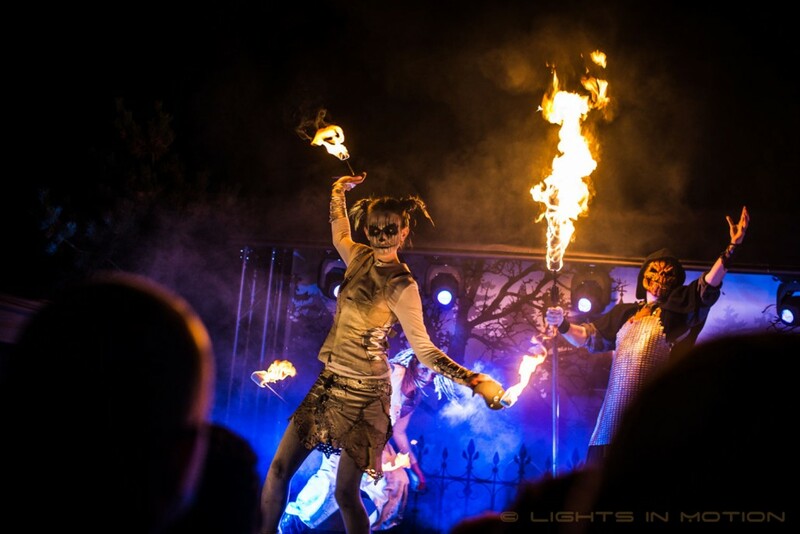 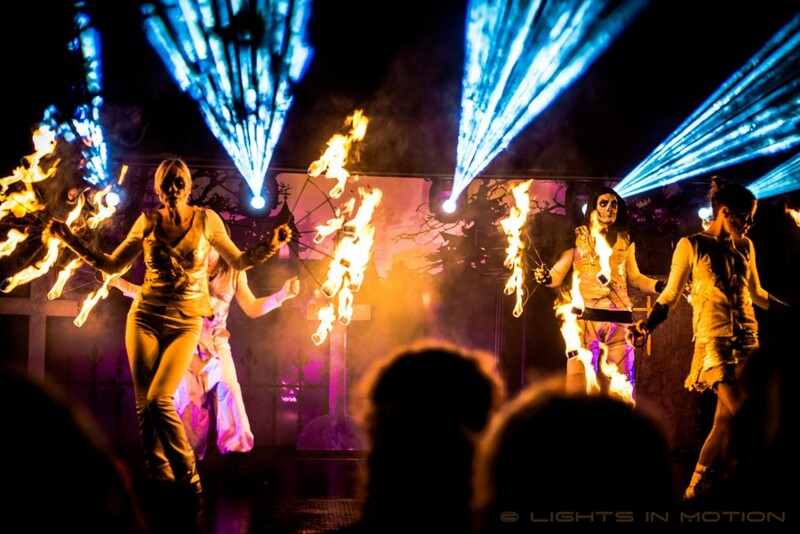 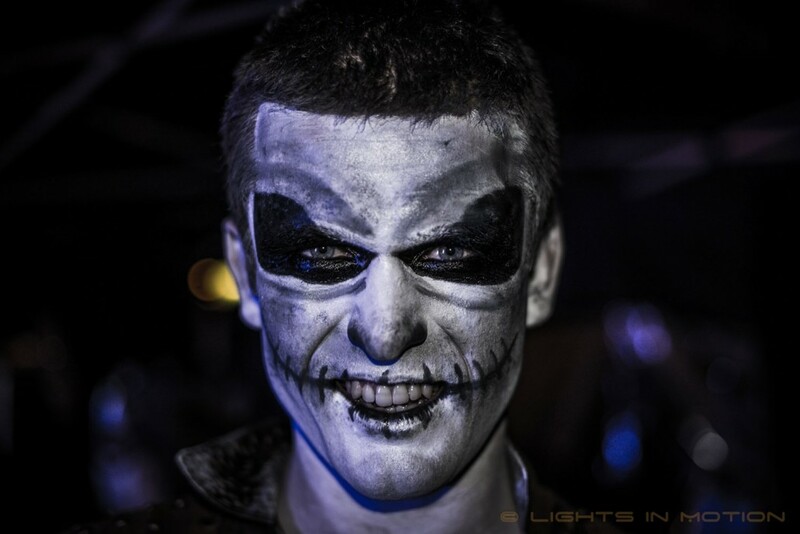 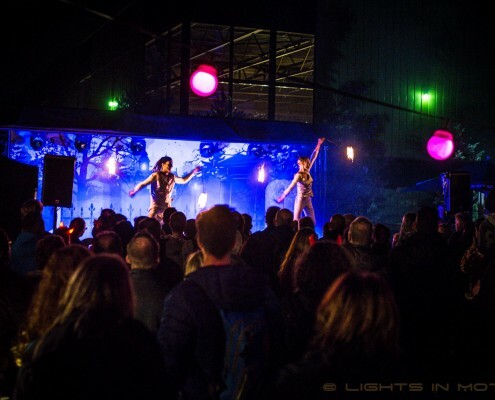 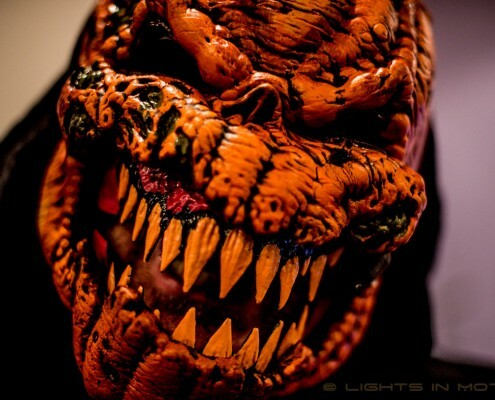 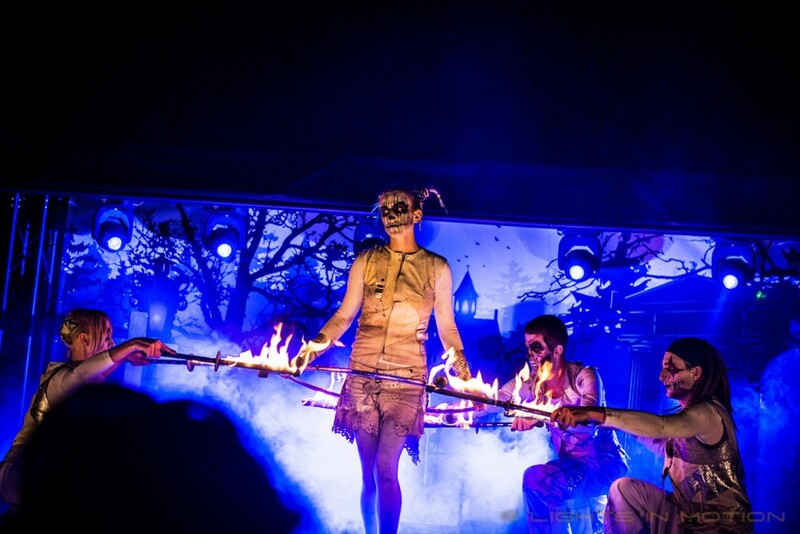 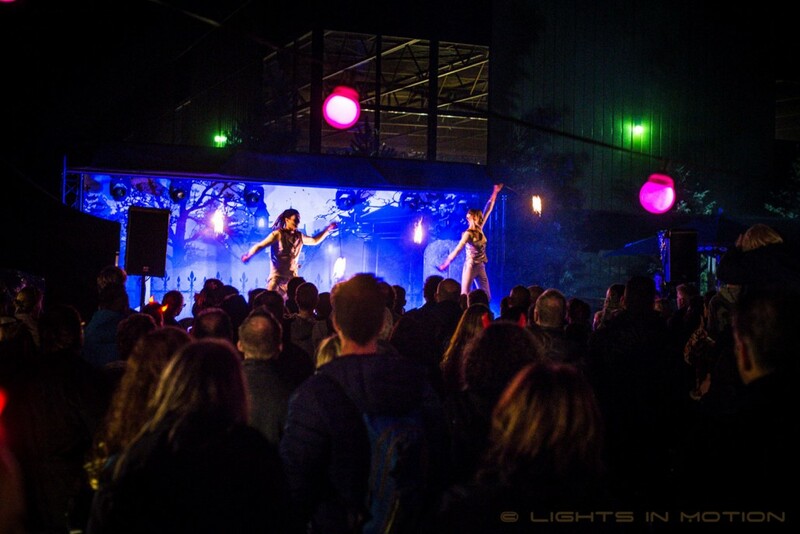 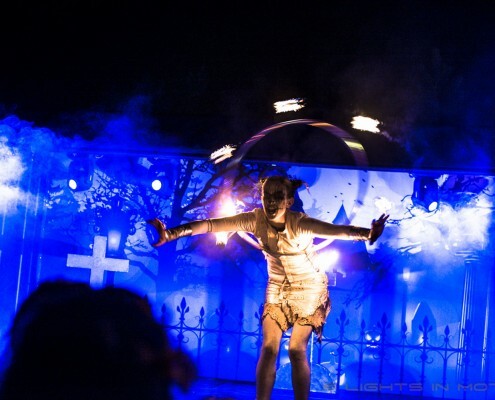 While numerous creepy characters roamed the park to scare the life out of the innocent visitors, Lights in Motion was asked to complement the theme with a Halloween styled fire and LED entertainment. 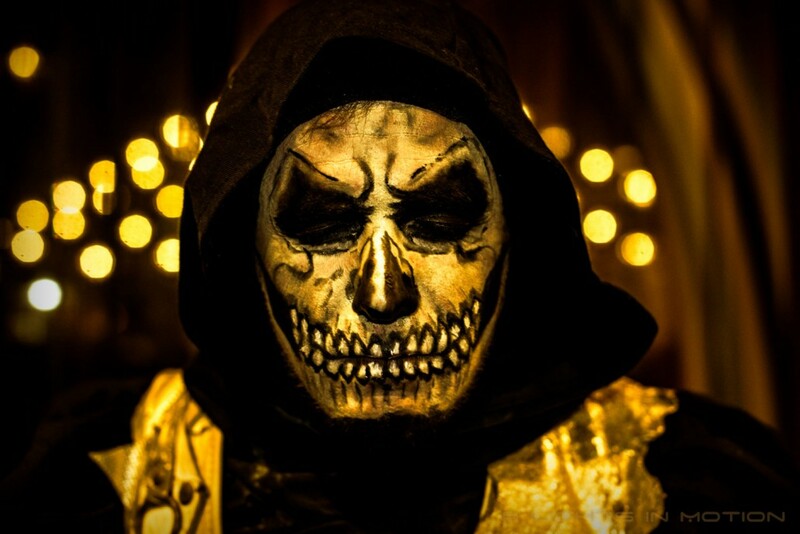 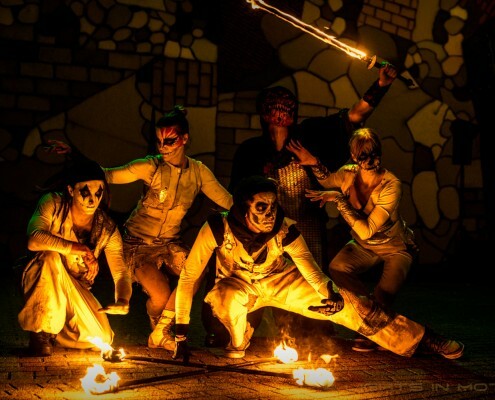 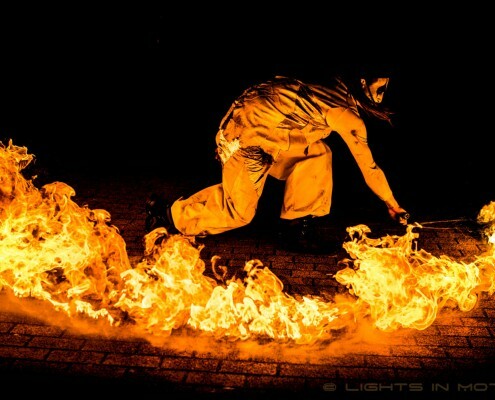 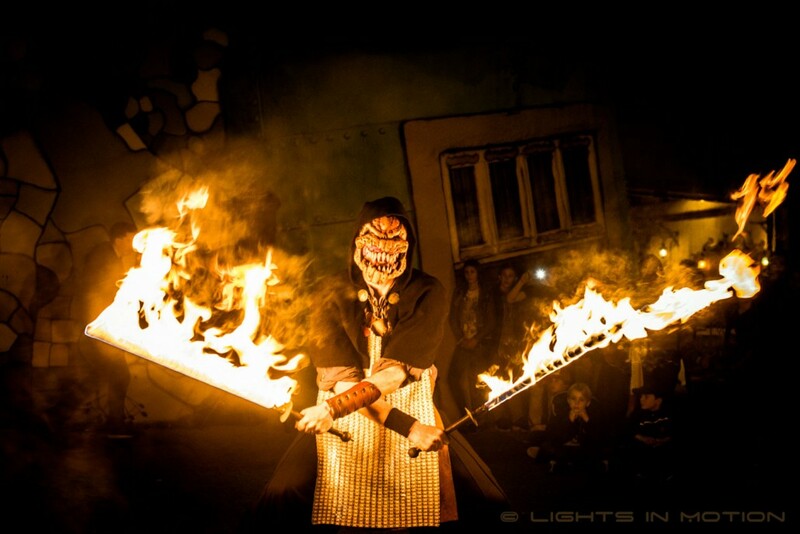 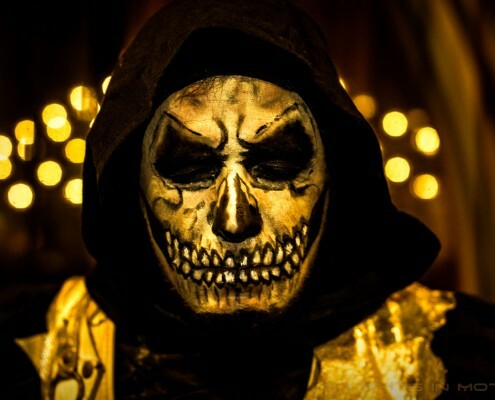 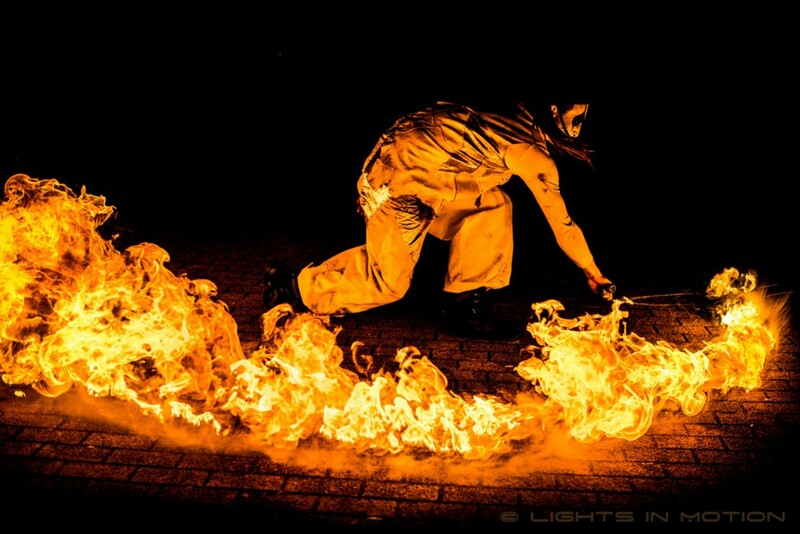 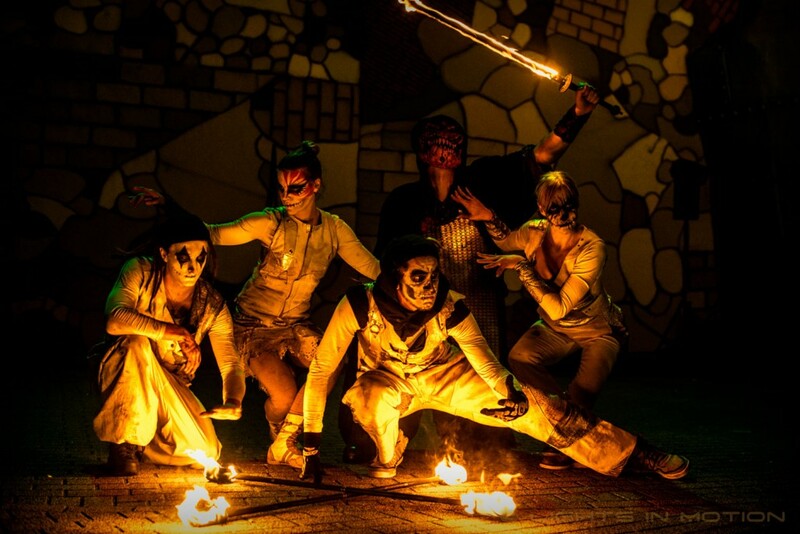 The fire shows took place at the Katara Plaza and the artists where dressed accordingly in Halloween characters. 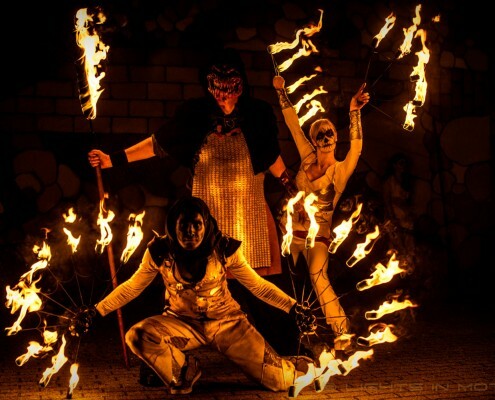 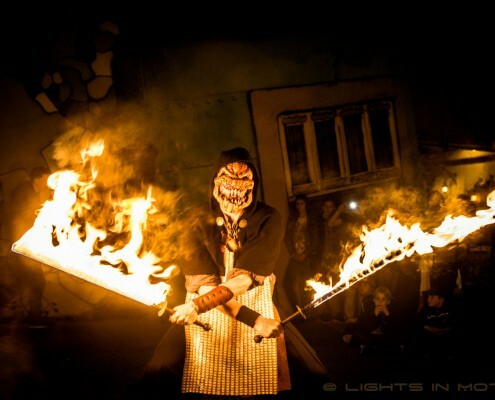 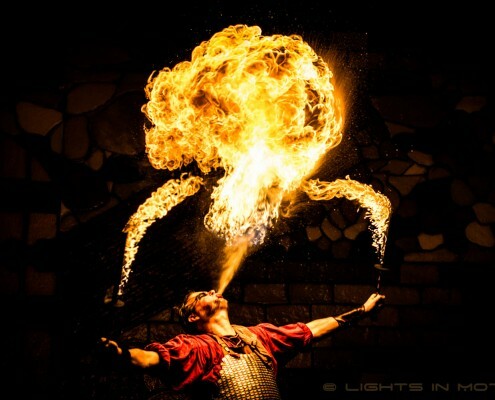 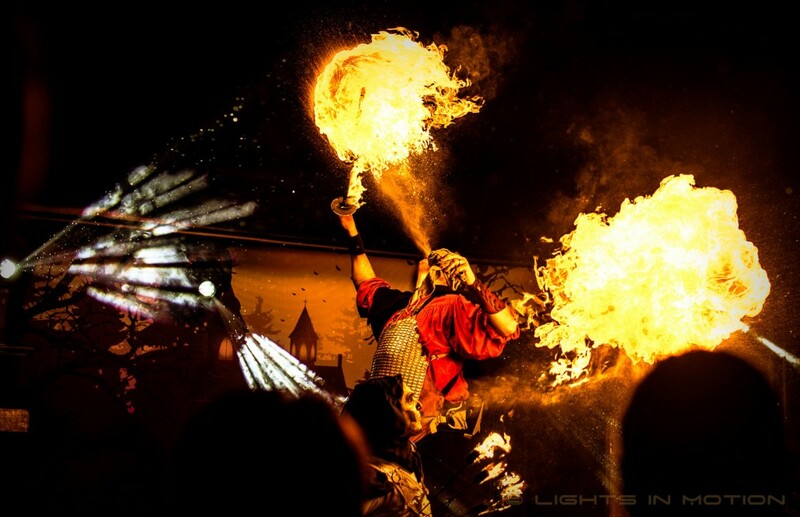 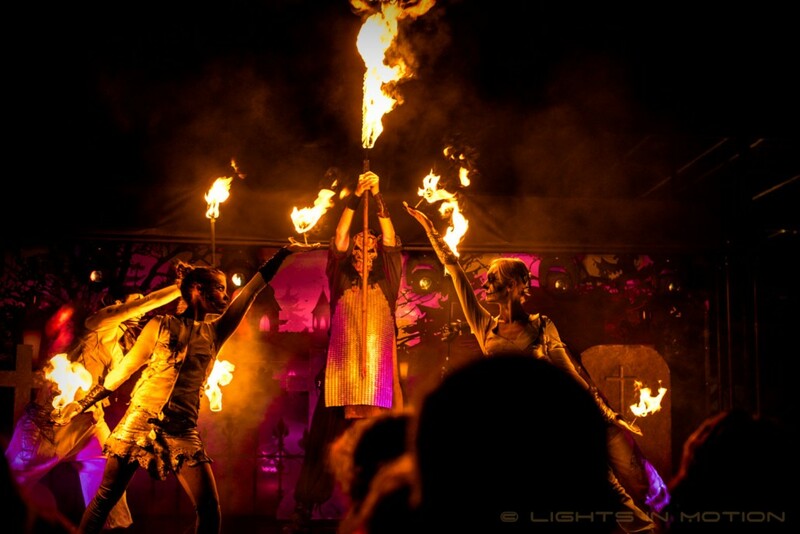 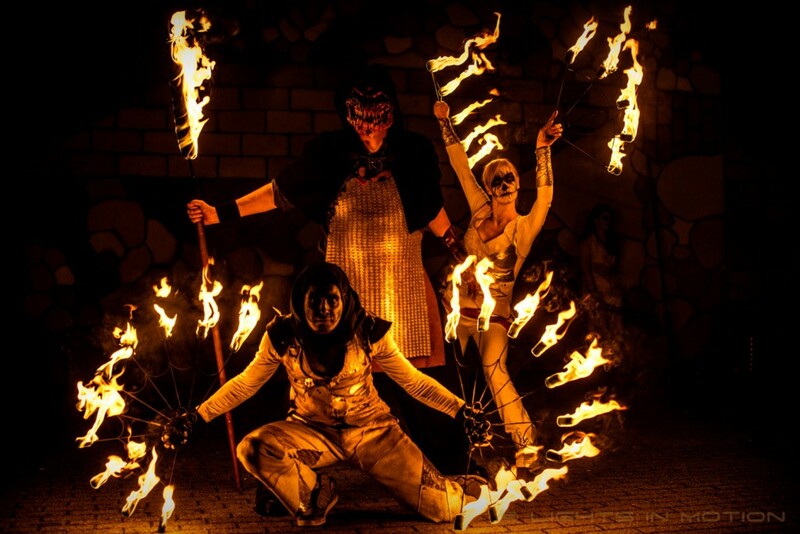 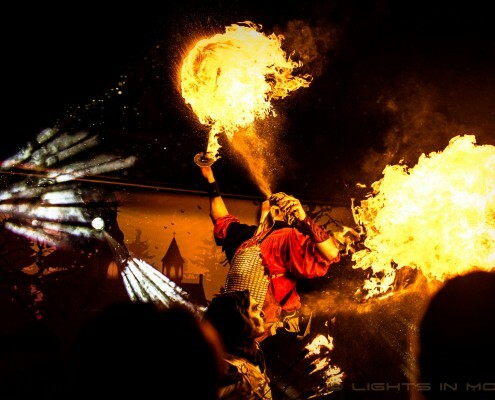 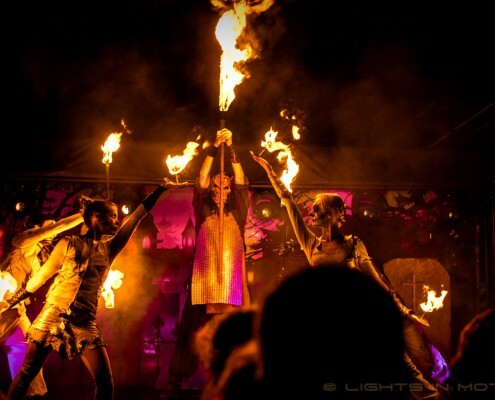 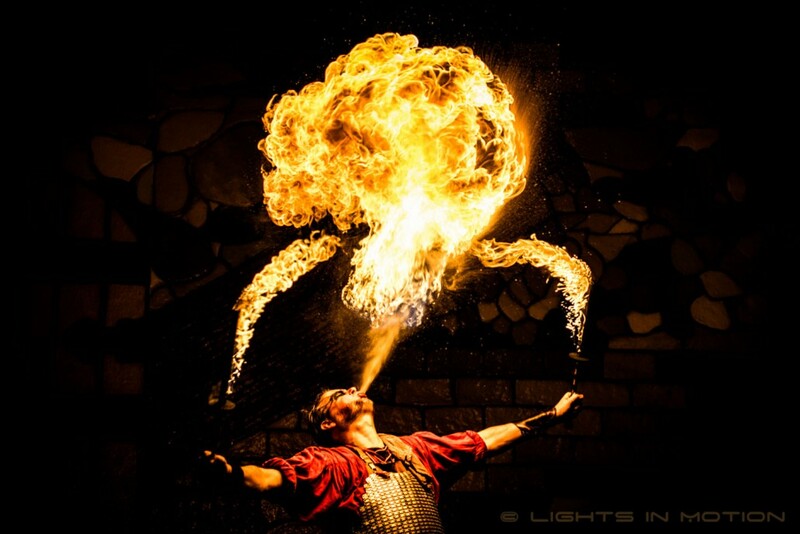 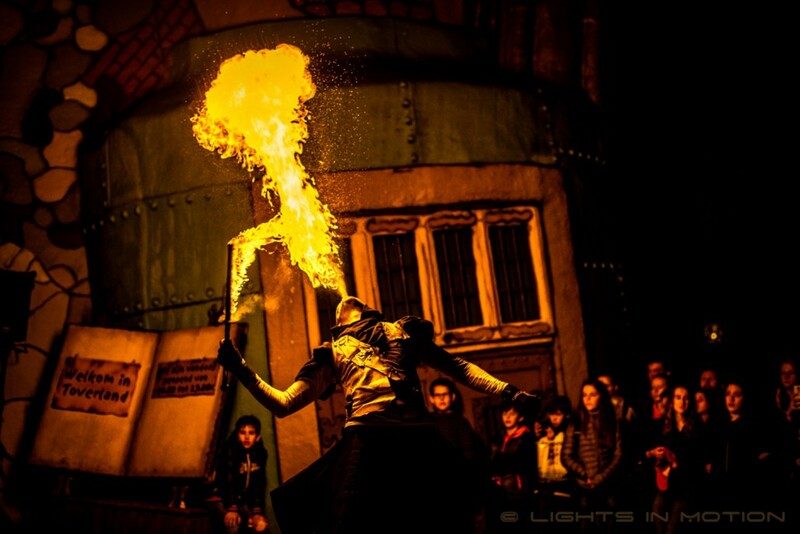 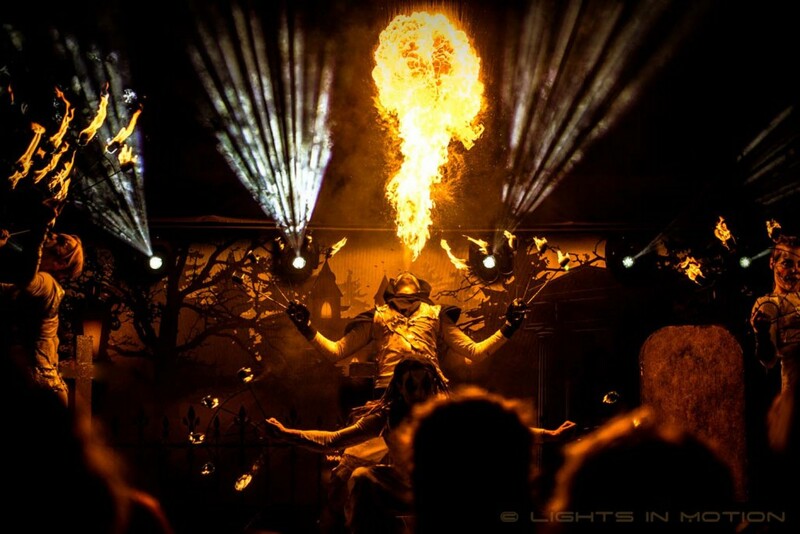 The first fire show of 19:30 was a thrilling experience in which the artists performed the rigorous choreographies with torches, hoop, staff, fans, poi and giant fire breathing flames in a gloomy Halloween style. 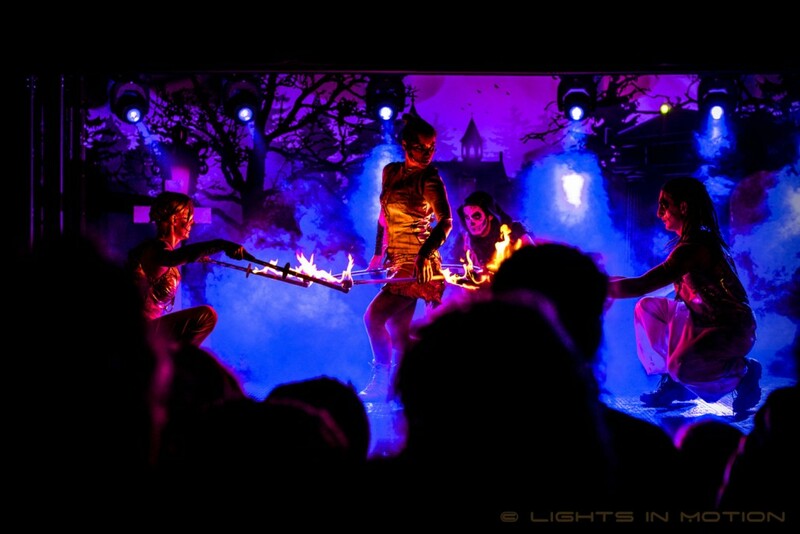 After the first fire show was finished the artists took their white flashing LED tools and joined the other creepy characters in the park to tease and terrify the children plus their parents in the scarezones of Toverland. 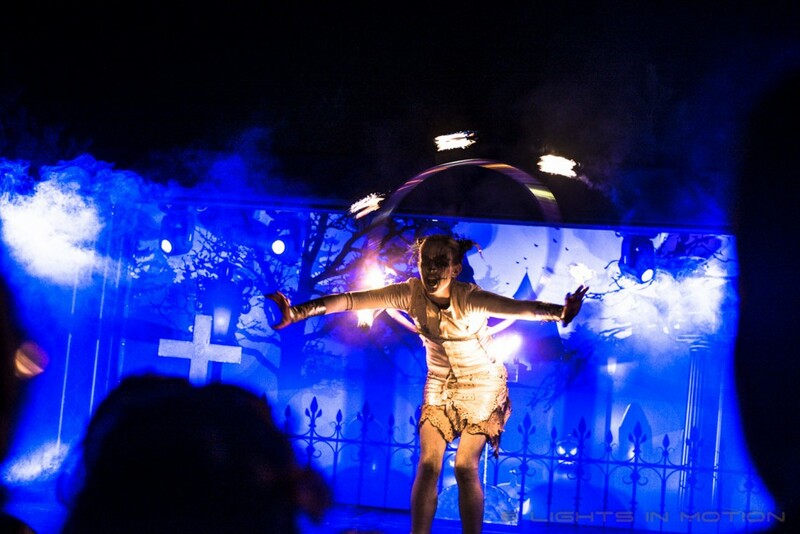 The second stage show was scheduled at 21:00 and was set up like the first show. 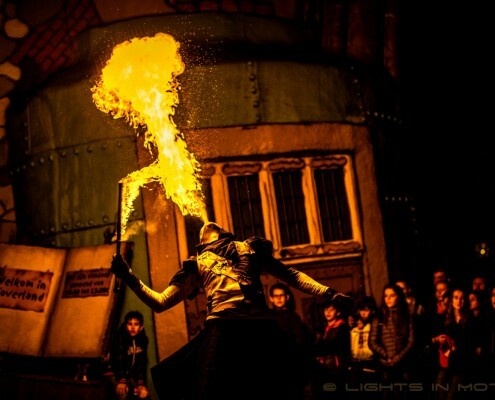 As a final gift at the end of the evening with the closure of the park, the fire artists provided a final freestyle fireshow at the exit of the park. 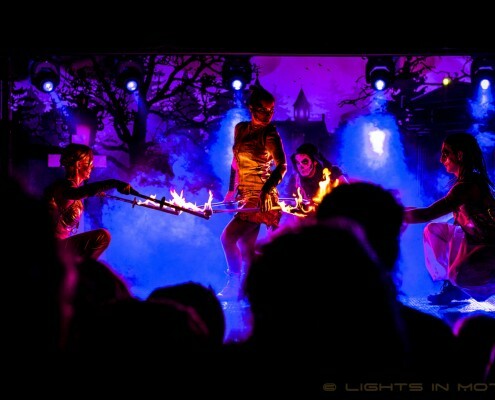 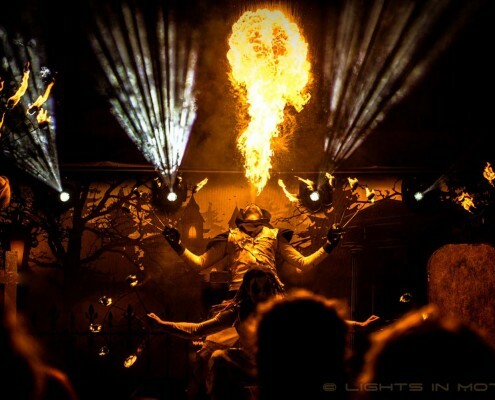 With this flaming moment of goodbye, Lights in Motion left their long-lasting impression on the visitors of Toverland.